After finishing tied for first place last year in the “B-2” division, Holmdel was moved up in the more competitive “B-1” division and did not make the playoffs. 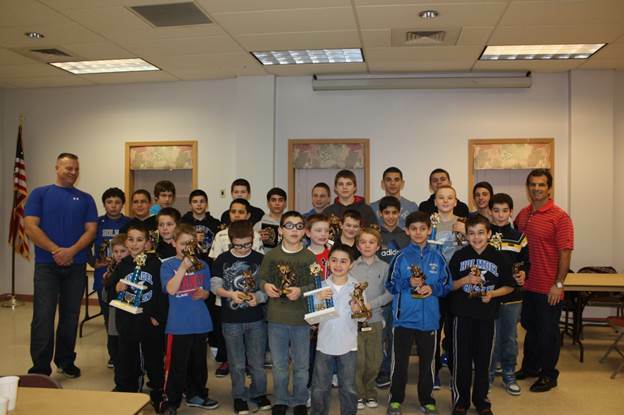 The Jersey Shore Junior Wrestling League consists of 32 teams split into A and B divisions. It is the most competitive league in the state, having won all star matches against other regions for three consecutive years. Holmdel finished 9-6 this year, after starting the season 1-3 due to 13 first year wrestlers in our program. Impressive victories against Berkeley as well as dominate performances against Long Branch and Jackson highlighted our season. The boys all improved and first year wrestlers gained valuable experience in our Tuesday and Thursday night league. By joining this additional league it enabled our wrestlers to complete in more matches and develop technique. We entered a very competitive Monroe tournament and had numerous excellent performances. Matteo Pinnero, Tom Ammirati, Jaden Gallo, Luke DuPont, Tom Ilvento and Aj Fernandez all finished with medals. Tre Tulenko, James Vanderham, Nicky Ammirati and Jack Cleary all competed in extremely tough weight classes and wrestled remarkably well. In our end of the season Jersey Shore Junior Wrestling League Individual Tournament, we wrestled very courageous as injuries and bad placements put some wrestlers in tough situations. Some highlights from the tournament was Zach Bair winning the 130 weight class to cap a 16-1 season and avenging an earlier season loss. Troy Gallo and Scott DuPont both wrestled injured and finished 3rd and 6th respectively, with courageous performances. Pedro Braga, Dean Gallo, Chris Ammirati, Seamus Wood and Thiago Braga all finished in 4th place out of 16 wrestlers, with Brian Frothingham, Matteo Pinnero and John Dietrich all finishing 5th or 6th place. The team practiced every Tuesday and Thursday, with an occasional Friday practice from November 15th to February 20th from 5:30 to 7:15. This year we combined teaching wrestling technique with emphasis on physical fitness training, including push-ups, sit-ups, pull-ups and various other athletic maneuvers to develop strength and coordination. HYAA will conduct a wrestling clinic beginning April 3rd and ending May 1st. We will have additional coaches and volunteers to spend more one on one time with wrestlers. We want to increase enrollment in our wrestling program. The clinic is for boys from ages 6 to 17 and will be very similar to our in season program. We will stress athletic training with strength and coordination as well as teaching basic and advanced wrestling technique. These workouts are extensive and were well received by our team, and we welcome all new wrestlers and athletes. Our end of year party occurred on March 5, 2013 and concluded with a team picture.